Homemade pretzels are a great snack for kids. 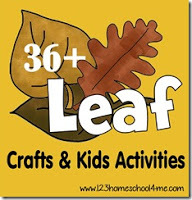 They are also a fun sensory activity and way for kids to practice building alphabet letters – especially important for Preschool and Kindergarten aged kids. 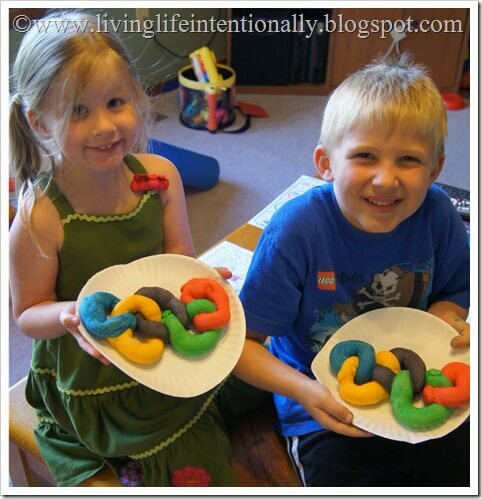 I wanted to have fun food for my kiddos as we watched the Olympic opening ceremony on Friday. 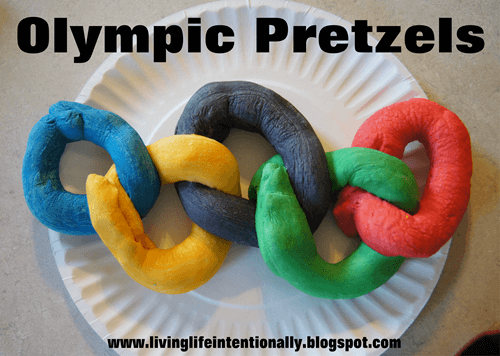 This was the first Olympics we’ve watched together as a family and I really want it to be fun & memorable =-) So here is what I came up with – Olympic Pretzels! Put 2 1/2 teas yeast in 1 1/2 cups warm water with 1 1/2 teas sugar. Mix and allow to foam – about 5 minutes. Mix 4 cups flour & 3/4 teas salt with yeast starter and knead 5 minutes. Make dough into 5-10 pretzels. To get the tops to brown beat an egg and brush on the top. You can use coarse or sea salt on top of the egg as well! Bake at 450 F on ungreased cookie sheet for 10-12 minutes. 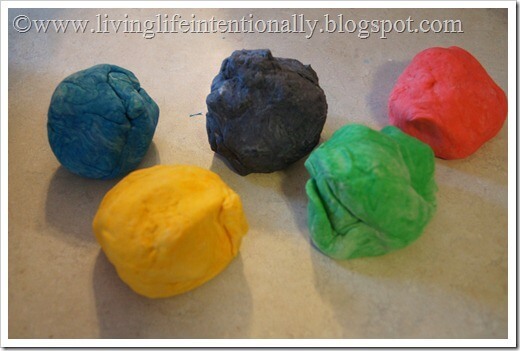 Then I made 5 balls and colored each ball with Wilton food coloring (you get truer colors that way). I made the ropes into rings that interlocked (like the Olympic logo) and baked on a non-greased cookie sheet at 450 for 10 minutes. 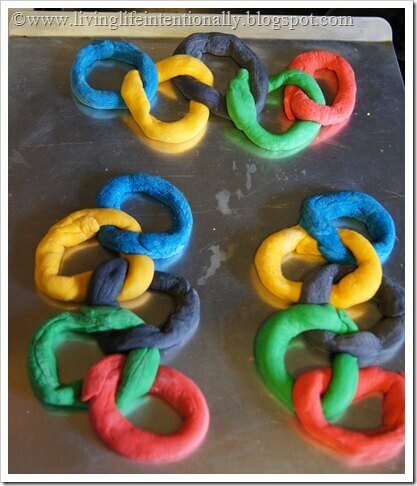 And here are our Olympic Pretzels finished. They were delicious, colorful, and SO FUN! 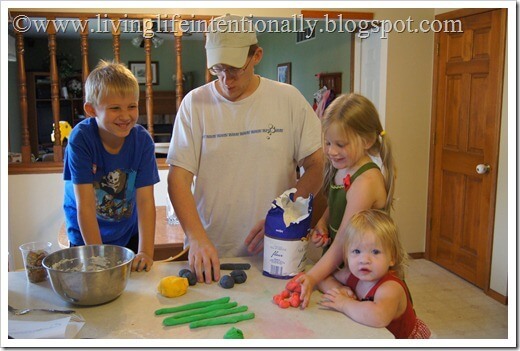 Pretzels are also a great sensory activity for toddlers. For Preschool and Kindergarten age children you can use the pretzel dough to practice making alphabet letters – a great hands on learning activity.